TH E M R EP O RT | 43 SPECIAL ADVERTISING SECTION // TECHNOLOGY COMPANY GUIDE Proventure Consulting KEY PERSONNEL Patrick Gonzalez President and CEO James Mayers VP, Business Development Michael Nielsen VP, Business Solutions Eduardo Hipolito VP, Application Development CONTACT INFORMATION 2522 Chambers Road, Suite 201 Tustin, CA 92780 Phone: 714.573.4077 Email: info@provencorp.com Web: ProvenCorp.com ProvenClaims.com ProvenClaims.Wordpress.com CORPORATE PROFILE Proventure is focused on business consulting, custom software solutions, and the implementation of best practice operational processes. Clients include medium- and large-sized financial services companies with significant experience supporting mortgage servicing operations. Proventure's Default Claims software product, provenClaims™, streamlines and centralizes claim processing, boosting staff productivity while reducing operational risk and exposure. COMPANY HISTORY Founded in August of 2000, Proventure began as a custom software development firm specializing in high-quality business applications and reporting systems. 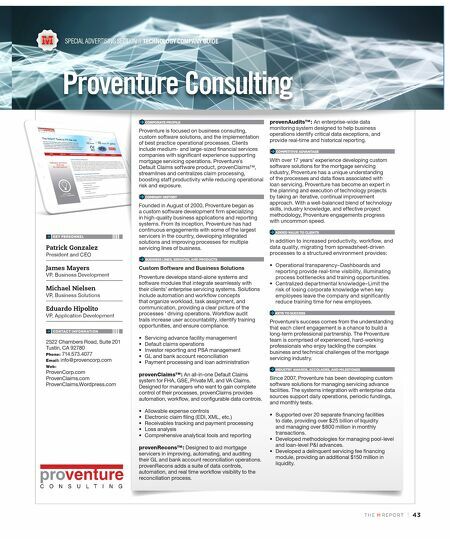 From its inception, Proventure has had continuous engagements with some of the largest servicers in the country, developing integrated solutions and improving processes for multiple servicing lines of business. BUSINESS LINES, SERVICES, AND PRODUCTS Custom Software and Business Solutions Proventure develops stand-alone systems and software modules that integrate seamlessly with their clients' enterprise servicing systems. Solutions include automation and workflow concepts that organize workload, task assignment, and communication, providing a clear picture of the processes ' driving operations. Workflow audit trails increase user accountability, identify training opportunities, and ensure compliance. • Servicing advance facility management • Default claims operations • Investor reporting and PSA management • GL and bank account reconciliation • Payment processing and loan administration provenClaims™: An all-in-one Default Claims system for FHA, GSE, Private MI, and VA Claims. Designed for managers who want to gain complete control of their processes, provenClaims provides automation, workflow, and configurable data controls. • Allowable expense controls • Electronic claim filing (EDI, XML, etc.) • Receivables tracking and payment processing • Loss analysis • Comprehensive analytical tools and reporting provenRecons™: Designed to aid mortgage servicers in improving, automating, and auditing their GL and bank account reconciliation operations. provenRecons adds a suite of data controls, automation, and real time workflow visibility to the reconciliation process. provenAudits™: An enterprise-wide data monitoring system designed to help business operations identify critical data exceptions, and provide real-time and historical reporting. COMPETITIVE ADVANTAGE With over 17 years' experience developing custom software solutions for the mortgage servicing industry, Proventure has a unique understanding of the processes and data flows associated with loan servicing. Proventure has become an expert in the planning and execution of technology projects by taking an iterative, continual improvement approach. With a well-balanced blend of technology skills, industry knowledge, and effective project methodology, Proventure engagements progress with uncommon speed. 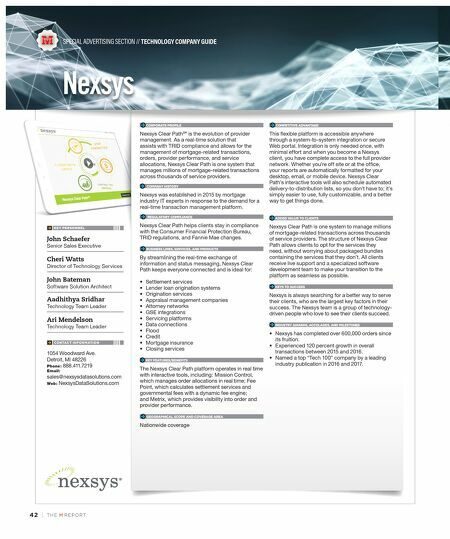 ADDED VALUE TO CLIENTS In addition to increased productivity, workflow, and data quality, migrating from spreadsheet-driven processes to a structured environment provides: • Operational transparency–Dashboards and reporting provide real-time visibility, illuminating process bottlenecks and training opportunities. • Centralized departmental knowledge–Limit the risk of losing corporate knowledge when key employees leave the company and significantly reduce training time for new employees. KEYS TO SUCCESS Proventure's success comes from the understanding that each client engagement is a chance to build a long-term professional partnership. The Proventure team is comprised of experienced, hard-working professionals who enjoy tackling the complex business and technical challenges of the mortgage servicing industry. INDUSTRY AWARDS, ACCOLADES, AND MILESTONES Since 2007, Proventure has been developing custom software solutions for managing servicing advance facilities. The systems integration with enterprise data sources support daily operations, periodic fundings, and monthly tests. • Supported over 20 separate financing facilities to date, providing over $25 billion of liquidity and managing over $800 million in monthly transactions. • Developed methodologies for managing pool-level and loan-level P&I advances. • Developed a delinquent servicing fee financing module, providing an additional $150 million in liquidity.